OPTIFOAM AG: OPTIFOAM AG DELIVERS SAFE, TARGETED RELEASE OF IONIC SILVER, PROVIDING AN ANTIMICROBIAL ENVIRONMENT FOR UP TO 7 DAYS WITHOUT CAUSING HARM TO HEALTHY TISSUE. 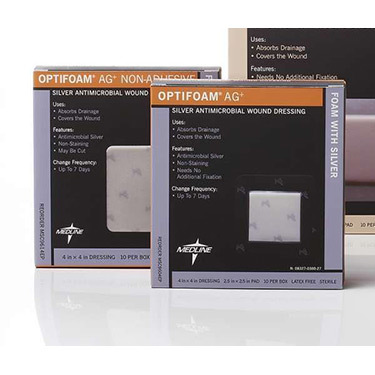 AT THE SAME TIME, OPTIFOAM AG DELIVERS OPTIMAL FLUID HANDLING, GREATER THAN OTHER LEADING BRANDS. THIS TRANSLATES INTO LESS FREQUENT DRESSING CHANGES, DECREASED POTENTIAL PAIN AND DISCOMFORT FOR YOUR PATIENTS AND REDUCTION IN TIME AND SUPPLY COSTS. NON-ADHESIVE 4 X 4. I am so pleased that I simply call one place and can receive all the items I need. And, I need a lot. You are a lifesaver for my aunt's needs.